This post was originally featured on the World Bank’s Development in a Changing Climate blog. If you are in a forest in Ecuador and see indigenous communities standing with an android phone, a measuring tape and a good pair of boots, don’t be surprised. 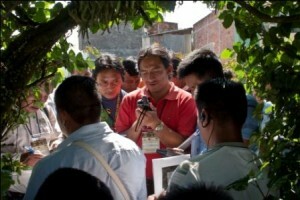 These ‘indigenous forest carbon monitors’ have been trained to collect field data by measuring a 40m x 40m sample plot. They align the center of the square plot with a GPS coordinate associated with the center of a satellite footprint, and measure the diameter of the trees in the plot. Once the measurements of the trees are determined, they are sent via phone to scientists who use satellite images – and now even images available on Google Earth – to estimate the amount of carbon stored in forests. These communities can efficiently traverse terrain that is typically inaccessible to foreign technicians. The result is better forest carbon density maps that can determine changes in the amount of forest carbon present over time. With the cutting and burning of trees contributing to about 15% of global carbon dioxide emissions, any realistic plan to reduce global warming pollution sufficiently – and in time to avoid dangerous consequences – must rely in part on preserving tropical forests. A critical part of ensuring that the rate of deforestation is decreasing – and the part where skeptics are most vocal – is monitoring, reporting, and verifying (MRV) the area and density of forests. The MRV process measures the amount of carbon stored in a forest, and also helps make sure that further deforestation and degradation do not occur. It also requires both modern technology and old fashioned boots on the ground. On the technical side, scientists analyze thousands of different satellite images, developing sophisticated algorithms to estimate the amount of carbon stored in forests based on what they see in the pictures. However, accurately translating what they see to actual carbon estimates requires large amounts of “field data” – the boots on the ground. This presents a great opportunity for indigenous communities to play a leading role in helping to reduce deforestation. Woods Hole Research Center (WHRC) and Environmental Defense Fund (EDF) have partnered with the Coordinating Body of the Indigenous Peoples of the Amazon Basin (COICA) to host a number of training workshops in Bolivia, Colombia and Ecuador, where measuring forest carbon was one of the most popular portions of the workshop that introduced them to REDD+ – reducing emissions from deforestation and forest degradation. WHRC, COICA, and EDF have identified many opportunities for Indigenous Peoples with proper training to contribute to the MRV of REDD+ policies. There is increasing interest and demand by local communities to be involved in the development of national forest carbon MRV systems, and a lot of potential for the World Bank’s Forest Carbon Partnership Facility (FCPF) program, for example, to help stimulate demand for indigenous involvement in MRV through programs at the national level. The next couple of years are crucial for many countries who are now developing forest carbon MRV systems on a national level, and it is important to ensure that these plans include Indigenous Peoples. REDD+ policies are currently being negotiated at international climate talks, and MRV will be a particularly hot topic at this year’s meetings, particularly given that its design – and role for Indigenous Peoples – was left undetermined at the 2010 U.N. climate change negotiations in Cancun, Mexico. But groups aren’t waiting for the parties to the United Nations Framework Convention on Climate Change (UNFCCC) to act. For example, as part of its Pan-Tropical Mapping Project, WHRC coordinates the technical skills of scientists, government technicians, and nongovernmental organizations throughout the world. Their capacity building efforts (through REDD+ workshops) with COICA are gaining international attention and have been the focus of a recent presentation to the World Bank. With training, local indigenous peoples are using their familiarity with the forest to do the same job, but with a few added benefits. While they gain a marketable technical skill, they are able to collect more field data and across larger areas. They also tend to have a greater stake in the process and design of national deforestation policies, resulting in better policies. The process provides them with better information about the state of their forests, leading to better land management and prepares them for negotiations with government and private investors. Learn more about EDF’s work with indigenous peoples protecting forests and livelihoods in the Amazon Basin. This entry was posted in Deforestation, Indigenous peoples, REDD+. Bookmark the permalink. Trackbacks are closed, but you can post a comment.